Coleraine have been handed a major boost ahead of this Saturday’s Irish Cup final as Darren McCauley has agreed a new two-year contract with the club. 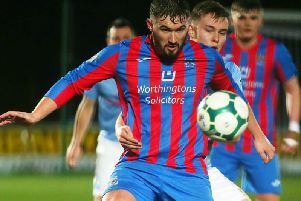 The 26-year-old had been the subject of interest for several clubs north and south of the border, but he has committed his future to the Bannsiders, who he feels are on the cusp of some exciting times. “I’m delighted to have signed the new contract,” said McCauley. “I would like to thank Oran (Kearney), Colin McKendry and the board for giving me this extension. “It is great knowing that Oran believes in me and I’m ready to repay that faith. “I’m going to work hard to ensure that Coleraine can be successful and win trophies. “I had a few offers from clubs in the Irish League and the Republic of Ireland, but I believe that Coleraine was the best fit. “We have qualified for Europe but I believe we shouldn’t stop there. “With a couple of experienced additions and the blend of young players there’s no reason why we can’t try and win the league. Coleraine boss Oran Kearney is delighted to have tied the talented wide man down to a new long-term deal. “We have worked very hard as a club over the last few months to secure the services of our players,” he said. “It’s important that we keep our top players at the club to give us a real platform.